This past weekend, Matt got called away to do an out-of-town job so it was just me and the kiddos. Silly me had the bright idea to invite over my niece as well (she's the same age as my stepdaughter) and just have one big playdate weekend with all the little guys. She's a really good kid, and can usually do a good job keeping the other three semi-calm. That worked for a couple of hours until everyone started whining that they were bored and that we didn't have anything to do at my house. My solution? Let's bake a cake! Of course, when I started throwing out ideas of what kind of cake to make, I kept getting a lot of "meh" and "We want to make something fun!" I threw on my thinking cap, and decided that an angel food cake is a time-consuming cake that would keep them busy for a while... but I'd never done anything besides plain angel food. The girls wanted to make something pretty, my little man wanted something sweet, so we went tropical. 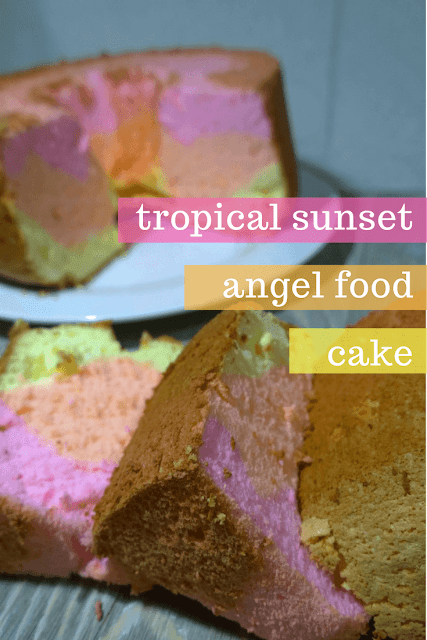 After it was done, they named it the Tropical Sunset Angel Food Cake. This cake was so delicious. It was light and fluffy and the flavors blended so well. It didn't even need a frosting, but if you were inclined to put something on it, I would recommend just a light powdered sugar dusting or maybe a thin glaze. 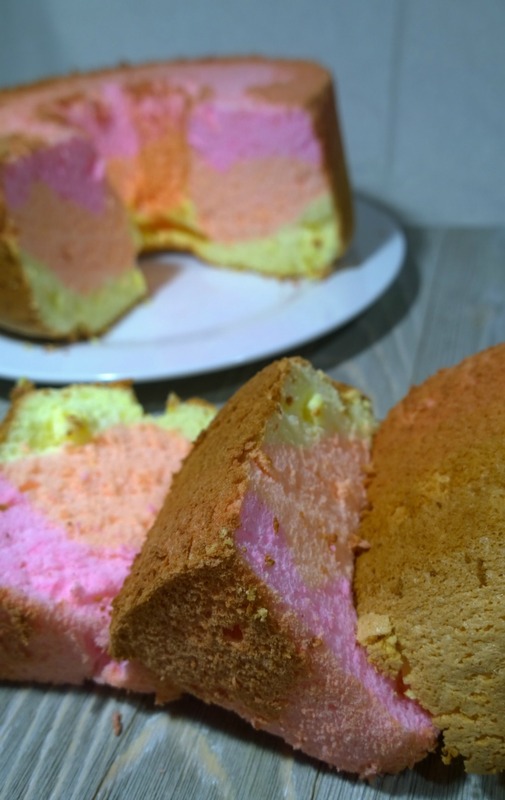 It also looks best when cut, the colors are so pretty that it overpowers the kind of bland look of an uncut angel food cake. You're probably dying to see how I made this right? Well, the trick was to gently fold the colors and flavors in, after the cake mix was completely done. If you've never made an angel food cake before, it's important to achieve a stiff peak with your egg whites in order to get the rise and fluff that makes an angel food cake stand out. 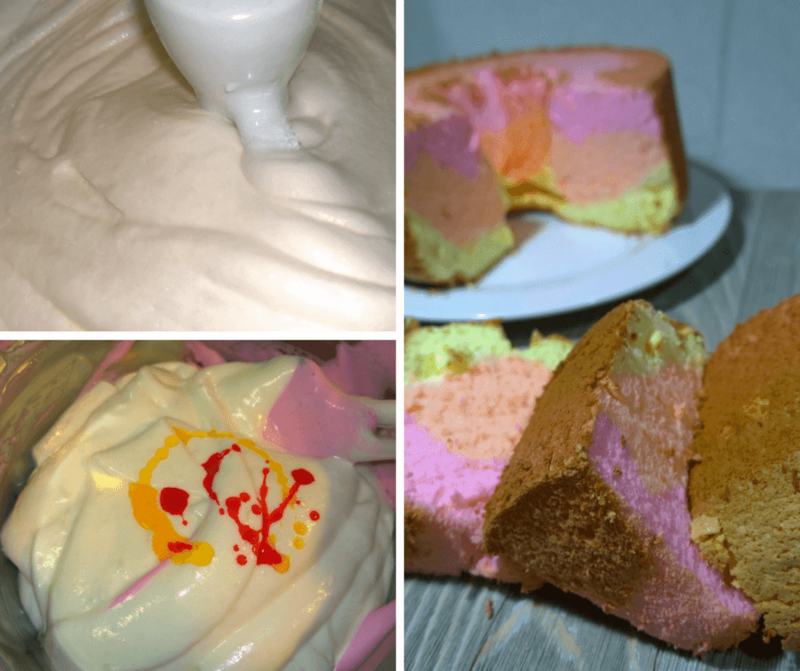 A light and fluffy angel food cake with subtle tropical flavors and gorgeous vivid colors. Using a stand mixer, combine egg whites with water, cream of tartar, and almond extract on low for about 2 minutes or until starting to foam. Gradually add in 1/2 cup of powdered sugar. Increase speed to high and mix until stiff peaks form. In a separate bowl, sift together cake flour, salt and remaining cup of powdered sugar. Gently fold into stiff egg whites. Separate the mixture into three smaller bowls and add in small amounts of the gel food coloring until you achieve your desired colors. Once you have the colors, add the orange extract into one and the coconut extract into the other. Leave one almond flavored. Carefully layer the three colors into an ungreased tube pan. Bake for 35-40 minutes. Cake is done when cracks on top of cake appear dry and a wooden skewer inserted halfway between tube and pan comes out clean. Cook upside down using a wine bottle or cooling rack. Notes: Be sure that all utensils and bowls are completely clean of any oils or grease or cake will not rise. Metal bowls and rubber spatulas are the tools I've found to work best for angel food cake.